FROM MDAH NEW RELEASES – A $12,500 grant from the Billups-Garth Foundation and contributions from dozens of individual donors will help fund the conservation and exhibition of one of the department’s rarest and most significant artifacts. The nearly two-hundred-year-old 20-Star United States flag was transported to specialists in West Virginia in January to undergo cleaning and stabilization that could take up to eighteen months. 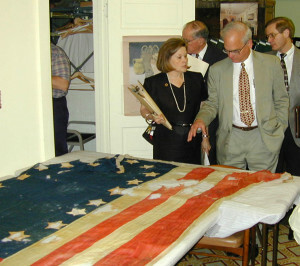 In this photograph from 2001, then-director of the Department of Archives and History Elbert R. Hilliard discusses the recently acquired 20-Star United States flag with former Old Capitol Museum of Mississippi History director Donna Bailey Dye. The historic banner has been adopted as a symbol of Mississippi’s bicentennial celebration in 2017. Acquired by the department in 2001, the gauze flag’s fragile condition was evidence that it had flown aboard a ship. Its frayed edges and numerous holes throughout the blue canton and red-and-white striped field prevented its public display.